You know the scenario…its early morning and its dark, cold and wet outside. You wrap up, pull the overcoat tight, put the head down and scuttle for the car. Safely ensconced, you put the key in and turn…nothing! You go again. There’s a brief spark of life but after some spluttering, the car returns to its’ vegetated state. Looks like you’re going to be late to work. Winter is not your car batteries friend. Why? Your car battery is essentially a chemically filled canister – the problem with batteries in the colder months is that those chemicals act slower when the temperature drops and subsequently fewer electrons are produced. Without these electrons the starter motor has less energy to get itself going! There are a number of ways of keeping your battery in optimal shape to prevent it from stalling during the colder winter months. First things first, get yourself some BOOSTER CABLES. You will use them at some stage either on your battery or someone else’s (learn how to jump start your battery HERE if you’ve never done so before). Invest in a good BATTERY CHARGER: It will end up saving you money and hassle in the long term! Keep it clean: Especially around the terminals and cables (remove signs of corrosion, dirt and oxidation etc.) You can use a screwdriver or pliers to scrape away any dirt. If the build-up of grime can’t be removed so easily, bring the car to a mechanic and have them take care of it. Avoid Short Trips: Starting the car in cold temperatures is particularly taxing on the battery (actually this is true in any temperature). Ergo, the less you start the car, the less work the battery has to do. Of course, the battery does need to be started up from time to time to hold a charge, so perhaps you can do a number of small errands in one go thus extending the car journey, and minimising the number of start up’s, or walk / cycle when possible. Disconnect: If you are going to be away for an extended period of time, or perhaps you for whatever reason won’t be driving for a number of weeks, you can disconnect the battery. This will prevent things like the car’s clock from draining energy. If your battery is in storage for some time, then a SOLAR POWER PANEL is a good investment for keeping it charged. Battery Blanket: If there’s space around the battery you could insulate it. If the battery tends to be idle for any extended period of time this is recommended. Minimise use of accessories when starting car! Heat it up: Should you find yourself needing to jumpstart your battery, you can reduce the stress on the battery by heating it up first. Strick the car in neutral and push it into the sunlight (yes, we know, that’s not exactly a consistent option here). 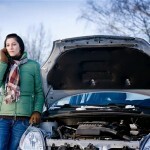 A batteries age is a key factor in how it holds up during the winter months. The older the battery, the more likely it is to seize up in colder weather conditions. 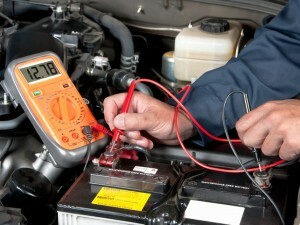 It is generally recommended that you replace the battery every 3-5 years. Some batteries have a 4 or 5-digit shipping date code engraved. The first digit from the left are generally the most important. The letter stands for the month of the year (A = January; B = February etc). The second digit from the left is the year that the battery was shipped from the factory (0 = 2010, 1 = 2011, 2 = 2012 etc). You can find a suitable battery for your vehicle HERE.